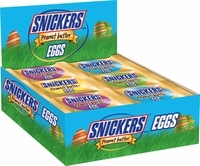 Snickers peanut butter eggs are quickly becoming a favorite Easter Candy. You get a chocolate egg filled with nougat, peanuts, caramel and a layer of peanut butter all in one great tasting Easter Egg. These are a perfect treat for those who can not make up their mind if they they would rather a Snickers egg or a Reese's peanut butter egg. Each box has 24 eggs.